Another solid four-star episode of The Flash earns itself an extra half-star for one of the most amusing, clever and non-gratuitous geek references in US TV sci-fi ever. And no, we’re not talking about Mason outing himself as a Game Of Thrones fan. Too often characters in contemporary-based SF movies and TV seem to have no cultural reference points at all when it comes to sci-fi, leading to some really clunky exposition, when all they really need to be told is, “You know, like in Star Trek.” Joe looks exactly like the kind of guy who’s seen all the big SF blockbusters so yeah, of course Cisco would use movies as a shorthand. Result: some fun dialogue and exposition that doesn’t sound like exposition and probably makes more sense to most viewers than a load of technobabble. Oh yeah, and a hilarious Doc Brown impression from Doctor Wells that has the same effect as some cringey wedding-reception-Dad-dancing (not sure if you’re embarrassed or amused). Admittedly, this kind of cross-referencing could easily get out of hand if overused but while it’s still quite rare (in the fantasy genre, certain vampire shows are tending to adopt a similar approach), let’s cherish it. As for the rest of the episode, well, to be honest, we’re in danger of sounding like a stuck needle: great FX; impressive fights; lots of witty dialogue (“I’m still inside Ronald”, “There has to be a better way to phrase that”); Iris turning into a vile character; Wells’s motivations are baffling; the arc plot concerning time travelling is twisting intriguingly; Grant Gustin continues to impress; etc etc etc. Mason Bridge is a Game Of Thrones fan if the casual reference to the “Dothraki” language is anything to go by. Maybe we should be moaning that it’s all becoming a little formulaic, but hell, this is season one. Most new shows are still finding their feet by episode 14. The Flash found its feet with the pilot and has been putting them to good, high-speed use since. We can accept that year one is all about establishing the formula before shredding it apart in season two. We’re cool with that. Besides, this episode also has the sparky relationship between conjoined energy twins Stein (Victor Garner) and Ronnie (Robbie “My cousin is Green Arrow” Amell) and the return of General Eiling (Clancy Brown) to give the episode some spice – great guest performances all. Thankfully Stein and Ronnie’s animosity has subsided into a mutual-respect-with-piss-taking by the end (constant bickering would be so tiresome), and Firestorm looks set to become an awesome ongoing character (how long before spin-offs are demanded by Amell 2 fans?). Iris and Mason, meanwhile, look like they want to be the new Woodward and Bernstein, but could end up looking more like scuzzy News Of The World hacks. It’s unclear whether the writers have consciously decided to turn Iris into a boo-hiss panto villain, but it’s very difficult – considering where viewers loyalties' are supposed to lie with this show – to have any empathy with her in this new development. 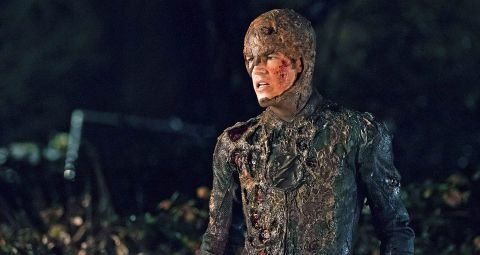 The other main jarring element of the episode is Barry learning that he – as an adult, in full Flash mode – was present at his mother’s death. He seems to accept the idea that he’s going to become a time traveller with remarkable pragmatism. You’d think something like that might shake his confidence for a couple of episodes. But hey! Then Grodd arrives and wants some payback for being prodded with an electrified cattle prod (or whatever Eiling’s torture device was). That’s the kind of final moment that leaves you caring not a jot about mere quibbles. Thank Grodd. We’re open to argument but… surely this is the first time in TV history that an episode of anything has opened with the image of a man trying to outrun a nuclear explosion? There’s clearly a clairvoyant graffiti artist in Central City – he appears to have predicted that our “HERO” would fall into Eiling’s “TRAP”. Responding to the comment “That's impossible”, Barry replies, "Impossible's just another Tuesday for us". The Flash airs on Tuesdays in the States. Then, immediately afterwards, Cisco mentions that they "have a guy locked up in the basement who can turn himself into poison gas. And that was just week three.” That’ll be Kyle Nimbus (the Mist), then, the metahuman villain from episode three. When Caitlin lies to Iris about where her “cousin” (actually Ronnie) comes from, she originally says Coast City then swaps her story to Midway. In the DC comics universe, Coast City is the hometown of Hal Jordan (Green Lantern) and Midway City is the hometown of the Doom Patrol, Hawkman and Hawkgirl. Blooper? Or has Joe just accidentally kicked Cisco’s 3D projector gizmo between episodes? Either way, the blood splatter has moved by about half a metre. Oh, and what’s happened to the house owner? After acting like a cougar last week she seems to have vacated the place altogether this week. We reckon she’s laying in wait for her moment to pounce on Joe. Barry seems to have developed telepathy – he fetches Professor Stein a pizza before he even asks him what topping he wants. And since the pizza arrives hot, he must have nicked a ready-prepared one from the pizza takeaway. We hope Stein likes pineapple with extra, extra, extra pineapple. Who the hell would order that monstrosity? Barry’s scar at the end of the episode may look curiously like the shape of the US state of Virginia. This is no coincidence. Grant Gustin comes from Virginia and the “scar” is covering up a tattoo he has there of his home state. General Eiling tries to get his hands on Firestorm, Barry learns that in the future hell travel in time back to the night of his mothers death and Iris instigates STARlabsgate.